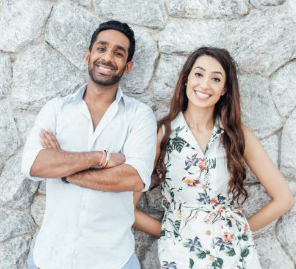 Sneh and Vishal made the most of their breathtaking wedding venue in Jaipur with classy décor and a host of fun events. Captivated by Jaipur’s charm, Sneh and Vishal decided to celebrate their big day at the luxurious Hotel Samode Palace. 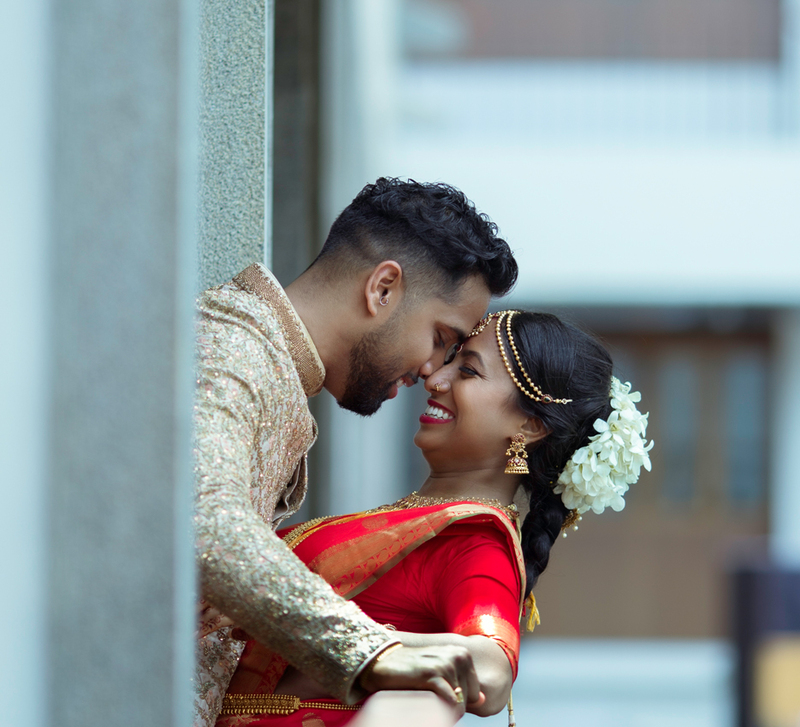 Here, we share highlights of their wedding, meticulously planned by WeddingSutra Favorite Momente – Wedding Planners. After months of careful planning, the big day arrived and Sneh and Vishal’s wedding festivities kicked off. It began with a very traditional welcome for all the guests in the gorgeous 16th century Samode Palace, Jaipur. 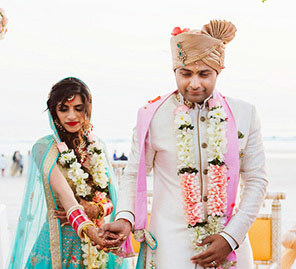 The mehndi was the kick-starter to all the fun – a gorgeous sundowner with lots of drinking and dancing. Eschewing the cliché bright colors and carnival ambience, the couple chose an elegant palette. Diwans and tables were dressed in deep pink and gold, fairy lights were strung along the lawns and driveway and the façade of the palace played backdrop. As for the bar, it was set up in front of the palace’s vintage car collection which was a lovely touch. As Sneh and Vishal got ready for their respective haldi ceremonies and a Ganesh puja in the two small courtyards of the palace, preparations for the wedding were underway at the Terrace of Samode Palace. When you have a venue that has the lush green Aravalli range as your backdrop,, all you need to do is set up a wedding mandap that takes in the view. The wedding decor included shades of white, red and gold in elements like drapes and flowers. Everything was aligned with the picture they had in mind. After the wedding, a celebratory dinner was hosted on the Darbar Hall terrace. The next day, while some guests lazed on the mats laid out on the lawns, others got busy playing cricket, volleyball and croquet. The décor was lively with colorful umbrellas and pompoms suspended from the trees and beautiful marigold arrangements decorating the tables. Stilt walkers, dhol players, a snake charmer and a puppet show turned up through the day to entertain the guests. The evening was again very elegant. A rustic bar was set up in the centre of the venue, under the canopy of a huge tree adorned with white cages and frames. It was a sit-down dinner so seating charts at the entrance and name place cards on the tables directed the guests towards their designated seats for the evening. Rustic canopies and bonfires were scattered towards the periphery of the venue for guests to chill out. The cake cutting and a few formal speeches later, the guests continued to enjoy the lovely food and party into the wee hours.